Rosh Chodesh Elul means one very important thing: Rosh Hashanah is just a month away. The time to start preparing yourself and stock up on inspirational reading material is now. Don’t wait until it’s too late! Spend this month learning and reading books and seforim that will inspire you to do teshuvah and better yourself. Here are ten great books to guide you through this time of awe – order today to make sure you get them in time for the High Holy Days! 1) ArtScroll Machzor: For years, the ArtScroll Machzorim have guided Jews all over the world through the High Holy Days prayers. With seven different layout options, we have the right fit for everyone. Browse our innovative Machzor Shop to find the one that’s right for you. 2) The Power of Teshuvah: Best-selling author Rabbi Heshy Kleinman has changed the way people approach davening with his Praying With Fire books. And now, in just a few minutes a day, you’ll learn about the power of Teshuvah, it’s laws and significance, as well as strategies to make sure your repentance lasts. 3) Twerski on Machzor: Rosh Hashanah: The wisdom and insights of Rabbi Abraham J. Twerski, M.D. are renowned throughout the world. 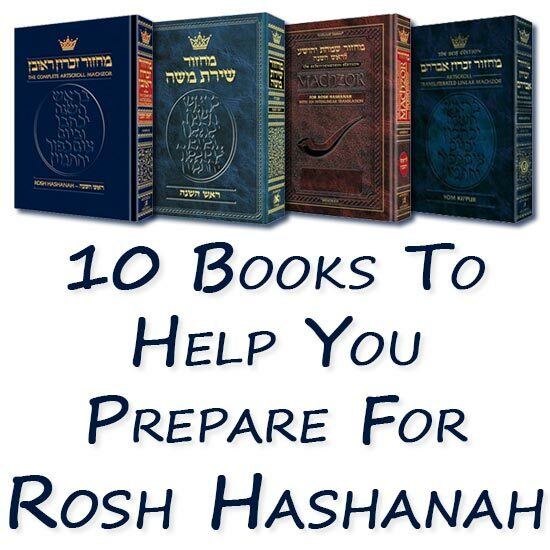 With this guide to Rosh Hashanah davening, he’ll take your hand and guide you through the prayers of Rosh Hashanah with insights and stories to inspire you and enrich your holiday. 4) Twerski on Machzor: Yom Kippur: Just like the Rosh Hashanah companion, Rabbi Abraham J. Twerski, M.D. guides you through the prayers and practices of Yom Kippur – starting with the significance of Erev Yom Kippur, right through Ne’ilah. 5) Pathway To Prayer: If you’ve ever found yourself lost during the Amidah portion of the Rosh Hashanah or Yom Kippur davening, or you feel that you don’t understand the words well enough and want to add a whole new level of understanding and meaning to your davening, this is the book for you. Line by line, Rabbi Mayer Birnbaum provides an in-depth translation to the Shemonah Esrei portion of the prayers, ensuring that you understand – and mean -ever word you recite. 6) Mesilas Yesharim (Coming soon in pocket sized! ): This historic work from ArtScroll makes the classic mussar work of the Ramchal understandable and relatable to its readers. With phrase by phrase translation, extensive notes and unique insights, this sefer will help you live Mesilas Yesharim. 7) Lights Along the Way – In this moving book, Rabbi Abraham J. Twerski, M.D. demonstrates, through the text of Mesilas Yesharim, how we can better ourselves and improves our lives. 8) A Touch of Purity: With his unique ability to inspire and touch his readers, Rabbi Yechiel Spero shares stories and insights into the mitzvah of Teshuvah. The perfect companion for the Elul and the Aseres Yemei Teshuvah, this book will give you inspiration as well as practical advice for the repentance process. 9) Inspiring Days: Featuring writings from top Jewish authors, this book give you timely insights into important issues such as connecting with the holiday prayers, becoming a better person, and achieving your personal goals. 10) Stories that Awaken the Heart: We are taught that this is a time of year to wake up and repent. This book will wake your heart and rejuvinate you and your will to do teshuvah through stories told by master storyteller and best-selling author Rabbi Binyomen Pruzansky.